Even though my children and I live in the middle of a national forest — the Sequoia National Forest and the world’s largest living trees (the giant redwoods) — we too have to be intentional about taking in nature. My boys also default to video games instead of outdoor play and hiking. It is almost a daily struggle to focus them on the outdoors instead of various “devices.” Part of what has helped us is our “dessert project.” I mentioned it some months back in talking about bay leaves and pine needles (here). Basically, I announce that we are going on a hike to look for a dessert ingredient and the boys line up like soldiers. What can compete with video games? It turns out that “tea” does fairly well too, especially tea sweetened with honey. Simply use a chef’s knife or scissors to cut the needles off the branch. Rough chop them with the knife (or cut them up further with the scissors). Use your chopped pin like you would any herb — pour hot water over it and let it steep. Experiment with the quantity to find your best flavor. 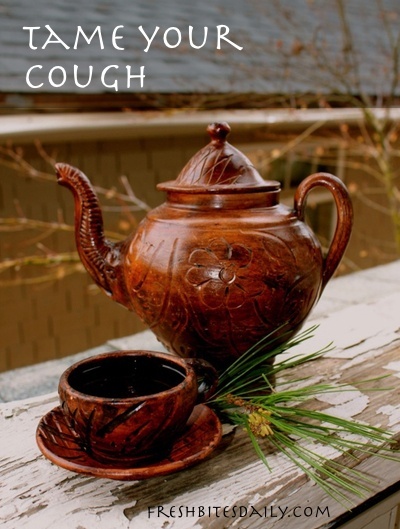 If you have a wicked cough, you might even brew up a cup to help cut through that stuffiness. 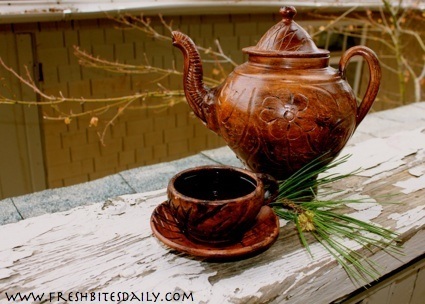 Pine is a great expectorant and may help break up the gunk in your lungs. For that case, herbalist Darcey Blue French in her book Introduction to Tree Medicine recommends one ounce of fresh or dried chopped needles, steeped or simmered in one quart of water. She recommends drinking four ounces of tea 2-3 times a day. Of course, you can also make the tea to suit your taste, but these proportions are a good starting-place. Pour water over needles. Cover. When I discuss pine, invariably the topic of safety comes up based on a study of the components of the Ponderosa Pine tree (here or for a more historical-descriptive version here). Most herbalists consider pine to be edible, some avoid the Ponderosa pine variety in particular, but this is one I would avoid in pregnancy even though you are discarding most of the needle.